Since I was still feeling a little weak after I got a foodborne illness (food poisoning) last week (which was almost gone last weekend), I had decided a few days ago to have a free day today and go out on a walk with Esme. Note: the toads mentioned are actually rain frogs. I am going to fix that one day soon. 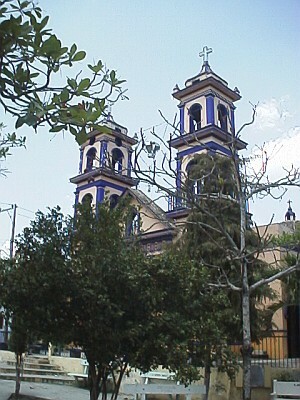 I had already picked two places the day before: Coyolillo and Trapiche del Rosario. Esme helped me with deciding to which to go, and we settled for Trapiche, also since it was close to Otates, and I wanted to see some tarantulas. So we took the bus to Plaza Crystal, a shopping center in Xalapa, from which we could take either a bus or a taxi to Trapiche. Taxi drivers try to get as many people in their taxi as possible since they make good many that way and not everybody has the patience to wait for the bus. Since we had taken a taxi before, and new it to be reliable, when someone offered us a ride, we took it. After a ride of roughly 20 minutes we arrived in El Rosario. We paid the taxi driver 40 pesos for both, and looked around. To the right were low hills, and I wanted to walk somewhere there. We walked more in the town, which turned out to be bigger then I expected, and tried to find our way to the "back" of the town. 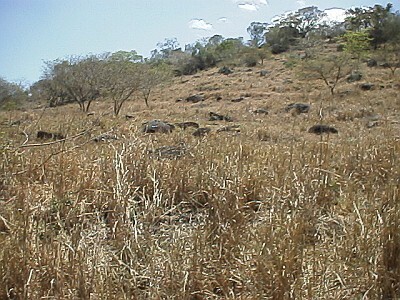 Grass and big stones: C. gracilis habitat? We finally got out of the town, and followed a dirt road. It was around 1 PM, and the sun was shining very hot. The surroundings looked very dry. To the right of us we saw a field covered with huge boulders. It looked to me an excellent habitat for Centruroides gracilis (Florida bark scorpion). I looked under small stones to the left and the right of the dirt road, but found nothing interesting. The ground under the stones looked quite dry and cracked. When we reached a house we noticed a frame of iron bars in the road which made it look like we were going to walk on private property. Since it was not really a gate, we decided to keep on walking despite the two chained dogs barking like crazy. To the left was a very dry and flat spot with many stones. I checked under the stones, but again nothing interesting. From the flat spot I had a nice view on the surroundings so I took two pictures. 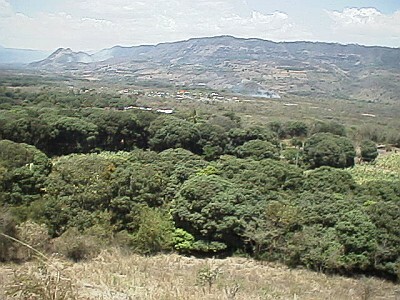 The first shows a mango tree grove and to the right a sugar cane field. The second picture is taken somewhat more to the left. We walked a bit more, and when I checked under a large stone to the right of the road, in a part that looked a little less drier, I found our first tarantula of the day: an adult male "Costa Rican tiger rump (Cyclosternum fasciatum)", between quotes since I am not sure if this is the same species, moreover since we're in Veracruz, Mexico, not Costa Rica. The animal was extremely beautiful despite the shrunken appearance of its abdomen. 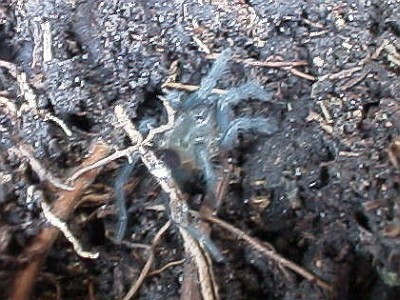 It looked like the legs had a deep bluish sheen to them, almost like velvet. The tarantula moved around a lot to get out of the sun as much as possible, and I was able to clearly see the hooks (spurs) on each front leg. This was clearly a male. I moved the tarantula out from under the stone (I let it walk on my arm), moved the stone back in its place, and carefully put the beautiful animal back very close to the stone so it could get back under it without any risk of being crushed. Nearby there was another big stone, and when I moved it towards me, I saw the cast-off skin of a scorpion (exuviae). Esme said that she saw something run under the part of the stone still touching the ground, so I moved it a bit more. 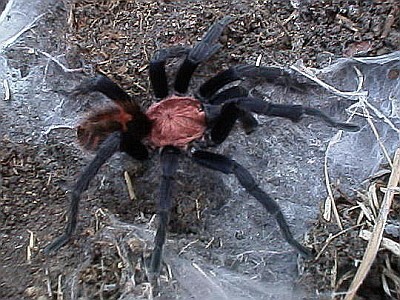 And there it was, another big tarantula. A good thing Esme noticed it, since I might have overlooked it, and accidentally crushed it when I moved the stone back into place. The tarantula spider clearly belonged to the same species as the one we had just seen, and when it moved a bit I could see the hook or spur on each front leg, so another male. 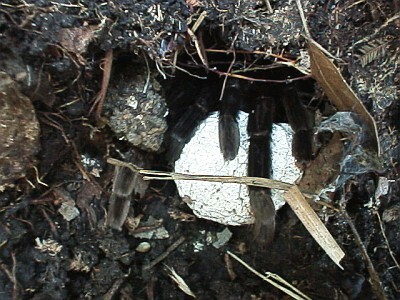 Then we noticed that the burrow, a vertical shaft, of the tarantula close to the exuviae of the scorpion also contained a exuviae of the tarantula. I decided to take both cast-off skins with me. Since I have seen Centruroides gracilis sharing the space under a stone with tarantulas of this species on previous field trips, I was quite sure that the exuviae of the scorpion belonged to this species. I didn't see the scorpion itself however, but since the ground under the stone was quite dry and had many cracks, it might have been hiding in one of those cracks. The hole the stone left was about 15 cm deep. 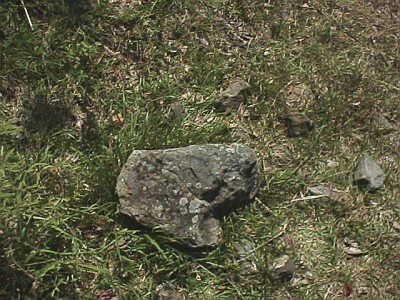 I took also a sample of the ground under the stone. I have plans to attempt to make high resolution scans of samples in order to give an idea of the kind of substrate that can be used with this species. Again I moved the tarantula away so I could replace the stone without harming the big spider. I also reordered the grass growing around the boulder, since I want to put things back the way how I found them as good as possible, disturbing nature as little as possible. I checked a few smaller stones closer to the road, and under one I found a very small tarantula. Despite its very small size (it could fit easily on a square of 1 cm by 1 cm), the "tiger rump" pattern was already clearly visible. Suddenly I spotted a very green patch. When I looked closer, I noticed a black tube running to the edge of it (farthest from the dirt road). I had seen that tube earlier, and assumed it was to transport water to the house we saw a bit further down the road. If my assumption was right, the green patch might have been the result of the tube leaking water. 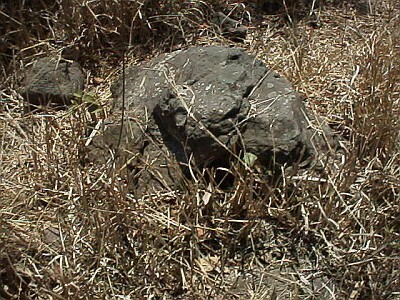 I noticed a big stone in the green patch, about one meter from the border with the dry landscape. When I lifted the stone we saw a lot of things happen at once: one very big tarantula with an egg sac moving towards the edge of the uncovered part, and disappearing almost entirely into a hole, another, smaller tarantula moving anxious up and down it's burrow, and disappearing in the part that went underground a bit. And very odd: several (about 5) small (5cm or so) toads jumping around, some joining the second tarantula, and one joining the first tarantula. The second tarantula was clearly a Brachypelma vagans (Mexican red-rump), but since so many things happened at once I couldn't recall if the first, big female was a vagans or a tiger rump. Since on earlier field trips (near Otates) I have seen both species under the same rock, it could be either species. It was clearly larger compared to the second one, and I was sure that this was the largest tarantula I had ever seen in Mexico. Esme made some shadow so I could take pictures. She suggested that next time we should take an umbrella, which is an excellent idea. 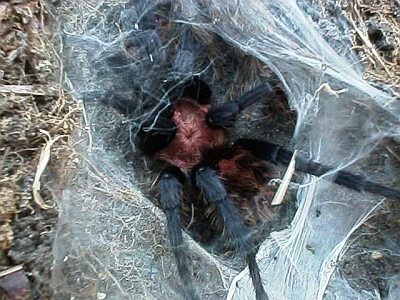 In the burrow of the second tarantula there was a cast-off skin. 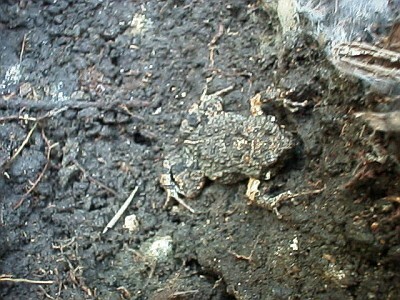 When I took a picture of it, one of the toads was trying to hide under it. 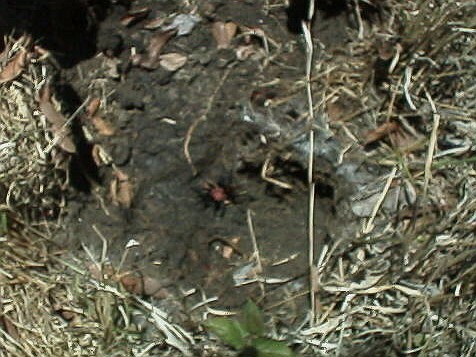 After I took the picture, I noticed a very tiny tarantula, trying to hide between some roots at the edge of the uncovered soil. 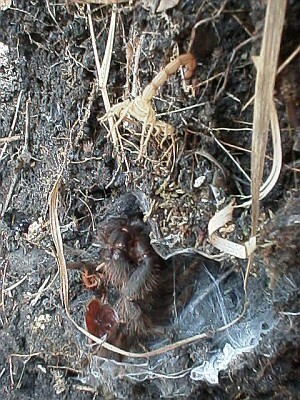 I noticed another baby tarantula, hiding in a hole next to a tiny cast-off skin and a yellow colored insect. Esme spotted a exuviae of a scorpion (or the remains of a scorpion) close to the second baby tarantula. There was so much to see in such a small spot. 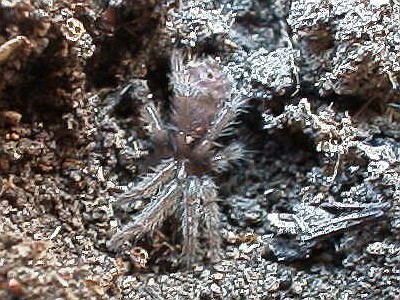 I carefully tried to make the second tarantula (B. vagans) come out of its hiding place with a piece of dried grass. There was also a small toad in the same hole, and since it was hopping here and there, annoying the tarantula, it was actually helping me. Finally the Red-rump decided to move out of its hiding place so I could take two pictures while Esme was trying to block out as much sunlight as possible. While taking the pictures I was wondering about the toads. 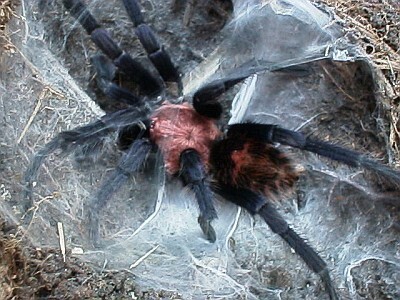 Why decided they to live so close to tarantulas? Because of this being one of the few places in the green patch that provided shelter? 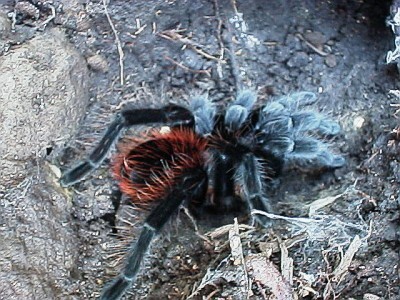 Or do both tarantulas just ignore the toads and don't consider them to be food? Since there was so much going on and so much to see, I decided to take an overview picture for reference (see below). 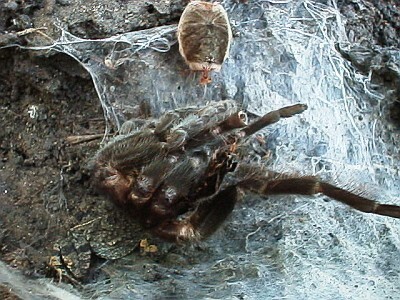 Notice how the burrow of the female with the egg sac (1) has its entry to the left in the picture, while the entry of the B. vagans (2) is to the right. The latter has also some webbing, and an exuviae (3). 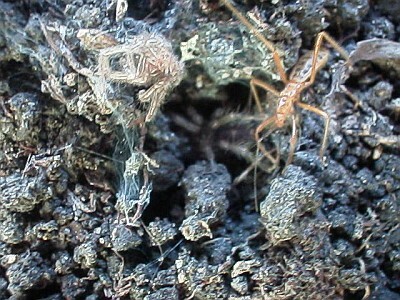 The exuviae of the scorpion (or remainders of a dead one) are in the left part of the image (4). Just above it (in the picture) is the hiding place of a baby tarantula (5). The rectangle shows how the previous picture, the one with the exuviae to the left and the yellow insect, was taken. 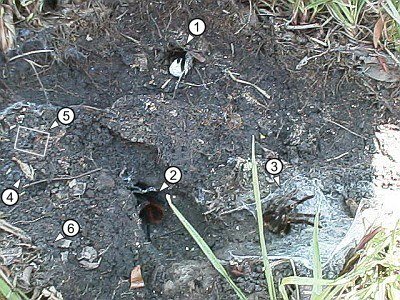 The other smaller tarantula was hiding somewhere in the left bottom corner (6). After the overview picture was taken, I moved the stone back in place. We both considered returning back later to have a second look and to see what species the female with the egg sac belonged to. Since the dirt road was clearly going to end near the house we saw nearby, we decided to walk downhill (to the left). We walked down the slope. To our right was a lot of wetness, and the smell made us guess that is was some kind of open sewer, yikes. Suddenly I noticed a part of a skeleton of an animal (probably a donkey): a ribcage and the back bone. Esme and I often joke that one day we might find a dead human body on our off the beaten track hikes, so I called her that I found a body. We walked more down, and I found the skull of the animal, and saw another, smaller, skeleton. We didn't go for a closer look but kept walking down. 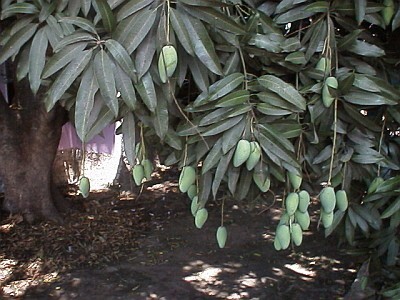 It was very hot, the sun was burning like crazy, and more down the mango grove started. When we came closer we noticed a small river at the edge of the grove. We decided to go back to Trapiche del Rosario by following the river, parallel to the dirt road we took above us. After a short while we had a break in the shadow. We noticed a nice purple butterfly, but when I moved towards it, it decided to fly up, so no picture. We continued our trip and saw many small birds hiding in the dry tall grass. When we came more near they flew all up, moving just a few meters ahead and hiding again. I looked under several stones, but found nothing that interested me. When a low wall, made of stacked up stones, showed up in front of us, and we decided to move uphill again, back to the dirt road. On the way up I checked under a few stones close to the wall and under one of them I found a tiny Brachypelma vagans (less then 1"). 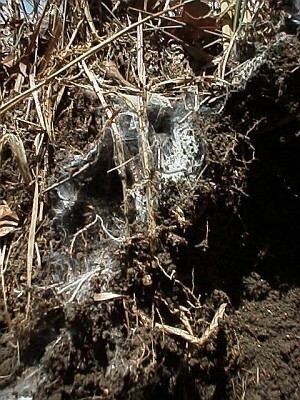 Again I took a ground sample. When we reached the top, we noticed that we had returned to the house with the two, now sleeping, dogs. Not for long, since when they noticed us they started to bark again like crazy. An way, we were back on the dirt road and returning from one of our shortest walks ever, but a lot we saw. A little later I couldn't resist checking under a big stone to, now the left, of the road. It was part of a low wall. 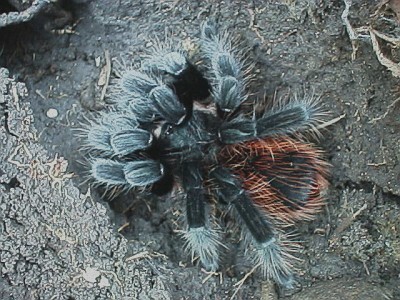 And there it was, another big "tiger rump" tarantula. I returned the stone back in it's original position, and we continued our walk back. Back in Trapiche del Rosario we decided to eat something. Earlier I had seen a small place where one could eat shrimp cocktails. Esme agreed, so we walked to that place. We first had both a medium one, but when we were finished, we wanted more, so we both ordered a small one. Later we bought a piece of smoked cheese and a piece of jamoncillo (a kind of candy, this one contained pineapple and coco) in another shop, and asked how to get back to Xalapa. We could either wait for a bus or find a taxi. After we had signaled a few taxis, all going to either Otates or Actopan we decided to walk towards the main road and try our luck there. 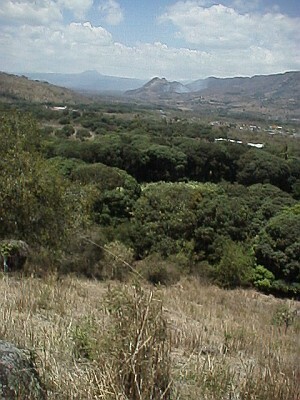 Before we reached the main road, a taxi stopped and soon we were on our way back to Xalapa for just 50 pesos. Note: I am interested to get an ID on the species the toad belongs to, especially since it almost looks like it's cohabiting with tarantulas.